Our newly-released Earnings Explorer, which is available to all Bespoke Institutional clients, is a great new tool for investors to utilize when companies in their portfolios have an earnings report coming up. It’s also a great tool to find new ideas and short-term trade opportunities. 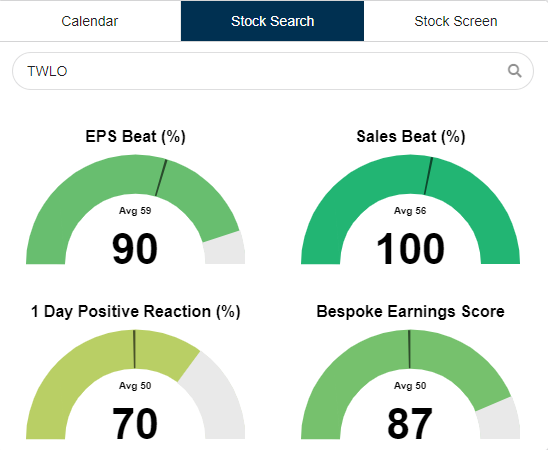 While in no way meant as a recommendation to buy or sell the stock ahead of earnings, the analysis below of Twilio (TWLO), which reports after the close on Tuesday, is meant instead as a way to highlight some of the aspects of our Earnings Explorer tool. For more in-depth earnings season analysis, start a two-week free trial to Bespoke Institutional and receive full access to our amazing Earnings Explorer tool. Headed into its Q4 earnings report, the growth technology stock TWLO has set a high bar for itself. We have flagged the stock in our Bespoke 50 for some time now as one of the top growth stocks in the Russell 3000 in addition to it earning the accolade of best-performing stock of 2018. This comes in part as a result of the company’s recent history of strong earnings reports. Scheduled to report after the close today (2/11), TWLO is coming off of back-to-back quarters of Earnings Triple Plays—beating EPS and sales estimates while also raising guidance. 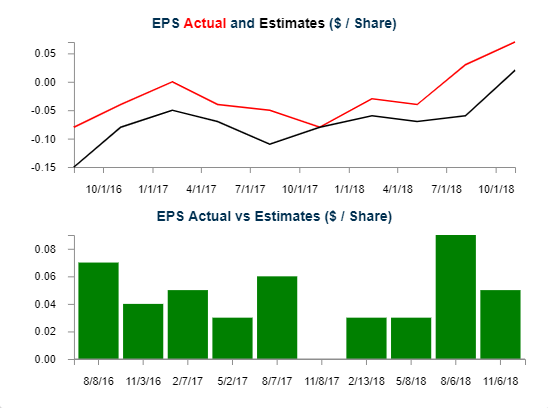 While time will tell if we see back-to-back-to-back Triple plays (something that certainly no one should be banking on but is also not totally out of the question), strong earnings reports are definitely nothing new for the company. Below we provide snapshots from our new interactive site’s Earnings Explorer showing a summary of how TWLO typically reports relative to expectations and then how it reacts to those reports. Below that we show the growth of EPS and revenues for the company over time. The top two gauges below show TWLO’s EPS and Sales beat rates at 90% and 100%, which is considerably better than the market averages of 59% and 56%, respectively. The two gauges below that show the percentage of time that the stock has reacted positively to its historical earnings reports (70%), while the other gauge shows the Bespoke Earnings Score, which is a proprietary measure which takes into account how often a stock exceeds EPS and revenue forecasts as well as how the stock typically reacts to beats or misses. In the ten quarters that TWLO has been public, it has beaten EPS estimates 90% of the time. The only exception was in November 2017 when EPS were in line with forecasts and the stock dropped 7% on its earnings reaction day. 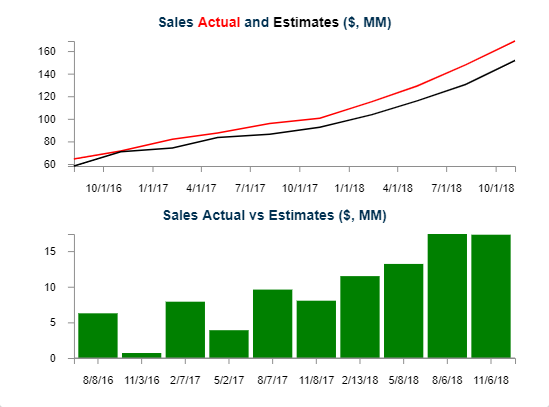 Even more impressive, the company has a flawless record when it comes to sales; sales have come in above estimates every single time the company has reported. Aside from topping forecasts, EPS and revenues have been steadily increasing over the past couple of years since TWLO went public. With such a strong track record of EPS and revenue beats, investors have noticed and increasingly flocked to the stock over the past year. 2018 did not see a single quarter in which TWLO didn’t rise 16% or more on its earnings reaction days. Last quarter, the stock saw a remarkable full day gain of 35.44%! While the stock has been positive more than negative, TWLO has a history of volatility in both directions, averaging a move of +/-13.75% change on earnings days. Contrary to last quarter’s jump, looking back to its report in May 2017, TWLO lowered guidance and the stock dropped over 26% on its earnings reaction day. Also, gaps higher are not always indicative of gains on the day. Throughout 2016 and 2017, the stock typically gapped higher only to shed some or all of these gains throughout the day. In other words, while the stock has, for the most part, reacted very well on earnings days, the insanely positive response has been more or less a 2018 phenomenon. Turning to Tuesday’s report, while there is no reason there can’t be another strong report along with huge upward price movement, and more specifically last quarter, volatility for the stock cuts in both directions. Additionally, with four straight quarters of such strong reactions to earnings, TWLO no doubt faces very optimistic expectations.